After the defeat of Napoleon, the Congress of Vienna of 1815 restored many other states which he had destroyed, but not the Duchy of Milan. Instead, its former territory became part of the Kingdom of Lombardy–Venetia, with the Emperor of Austria as its king. In 1859, Lombardy was ceded to the Kingdom of Piedmont-Sardinia, which would become the Kingdom of Italy in 1861. The House of Visconti had ruled Milan since 1277, in which year Ottone Visconti defeated Napoleone della Torre. The Duchy of Milan (Ducatus Mediolani) as a state of the Holy Roman Empire was created on 1 May 1395, when Gian Galeazzo Visconti, lord of Milan, purchased a diploma for 100,000 Florins from King Wenceslaus. It was this diploma that installed Visconti as Duke of Milan and Count of Pavia. At its foundation the duke's dominions included 26 towns and spanned from the hills of Montferrat to the Lagoons of Venice,[dubious – discuss] and included all the former towns of the Lombard League. Milan thus became one of the five major states of the Italian peninsula in the 15th century. When the last Visconti Duke, Filippo Maria, died in 1447 without a male heir, the Milanese declared the so-called Ambrosian Republic, which soon faced revolts and attacks from its neighbors. In 1450 mercenary captain Francesco Sforza, having previously married Filippo Maria Visconti's illegitimate daughter Bianca Maria, conquered the city and restored the Duchy, founding the House of Sforza. During the rule of the Visconti and Sforza, the duchy had to defend its territory against the Swiss, the French and the Venetians, until the Betrayal of Novara in 1500 when the duchy passed to the French-claim of Louis XII. In 1498, the Duke of Orleans became King of France as Louis XII, and immediately sought to make good his father's claim to Milan. He invaded in 1499 and soon ousted Lodovico Sforza. The French ruled the duchy until 1512, when they were ousted by the Swiss, who put Lodovico's son Massimiliano on the throne. Massimiliano's reign did not last very long. The French, now under Francis I, invaded the area in 1515 and reasserted their control at the Battle of Marignano. The French took Massimiliano as their prisoner. The French were again driven out in 1521, this time by the Austrians, who installed Massimiliano's younger brother, Francesco II Sforza. Following the French defeat at Pavia in 1525, which left the Spanish imperial forces of Charles V dominant in Italy, Francesco joined the League of Cognac against the emperor along with Venice, Florence the Pope, and the French. This resulted quickly in his own expulsion from Milan by imperial forces, but he managed to remain in control of various other cities in the duchy, and was again restored to Milan itself by the peace concluded at Cambrai in 1529. In 1535, Francesco died without heirs, the question of succession again arose, with both the emperor and the King of France claiming the duchy, leading to more wars. 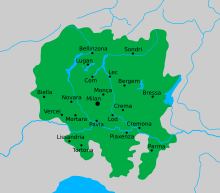 The Duchy of Parma was created in 1545 from a part of the Duchy of Milan south of the Po River, as a fief for Pope Paul III's illegitimate son, Pier Luigi Farnese, centered on the city of Parma. The emperor Charles V, Holy Roman Emperor held the duchy from 1526, eventually investing it on his son Philip II of Spain. The possession of the duchy by Habsburg Spain was finally recognized by the French in the Treaty of Cateau-Cambrésis in 1559. The Duchy of Milan remained in Habsburg Spain hands until the War of the Spanish Succession (1701-1714), when the Austrians invaded it (1701). The Treaty of Baden, which ended the war in 1714, ceded Milan to Austria. The duchy remained in Austrian hands until it was overrun by the French army of Napoleon Bonaparte in 1796. The duchy was ceded by Austria in the Treaty of Campo Formio in 1797, and formed the central part of the new Cisalpine Republic. After the defeat of Napoleon, based on the decisions of the Congress of Vienna on 9 June 1815, the Duchy of Milan was not restored. The Duchy instead became part of the Kingdom of Lombardy–Venetia, a constituent of the Austrian Empire and with the Emperor of Austria as its king. This kingdom ceased to exist when the remaining portion of it was annexed to the Kingdom of Italy in 1866. ^ a b c Simonde de Sismondi, Jean-Charles-Léonard (1832). Italian republics: or the origin, progress, and fall of italian freedom. London. ^ Knight, Charles (1855). The English cyclopedia: geography. London. ^ Aeneas Sylvius Piccolomini (Pope Pius II), The Commentaries of Pius II (Northampton, Massachusetts, 1936-37) pp. 46, 52. ^ Cecilia M. Ady, A History of Milan under the Sforza, ed. Edward Armstrong (London, 1907) pp. 56-60. ^ Cartwright, Julia (1899). Beatrice d'Este, Duchess of Milan, 1475–1497: A Study of the Renaissance. Hallandale.